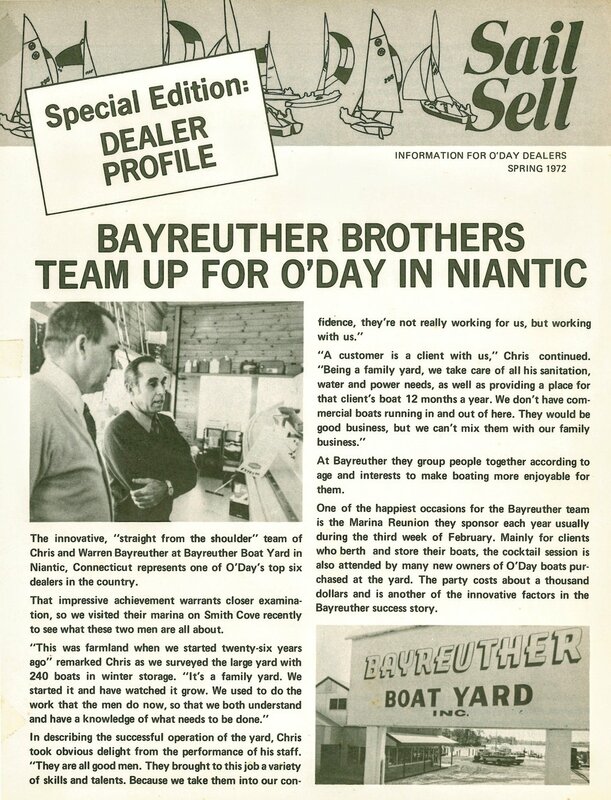 1972 Bayreuther Boat Yard — O'Day Mariner #1922 "Orion"
1965 Flyer - "Proven Performance"
O'Day periodically sent out a little newsletter to keep O'Day dealers up-to-date on what was happening. 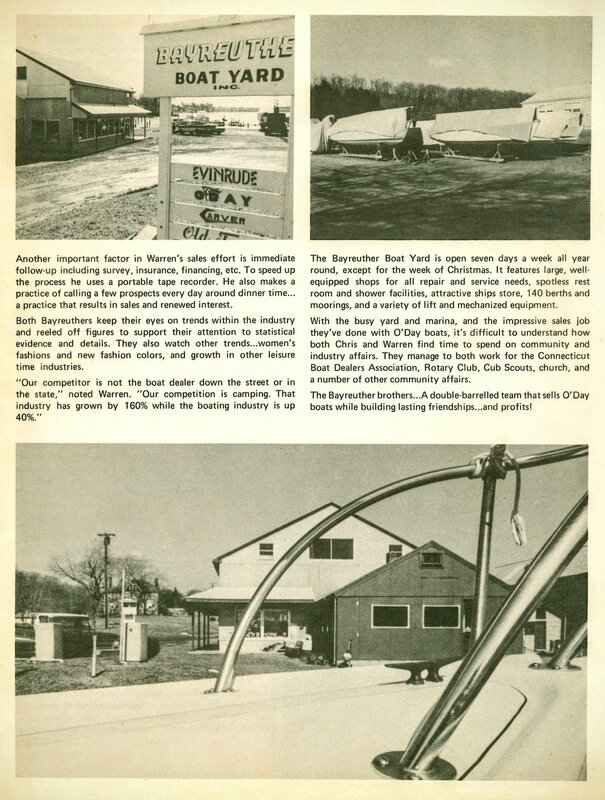 This "Special Edition" of Sail Sell highlights the partnership of O'Day with Bayreuther Boat Yard in Niantic, Connecticut, and it features a Mariner in one of the pictures, on its trailer in the showroom. This Mariner is an early-style 2+2 with varnished mahogany coaming tops. "BBY", run by Christian Bayreuther III and Warren Bayreuther (my grandfather and grand-uncle), became one of New England's largest O'Day dealers. Built shortly after World War Two, BBY remained in business serving the southeastern Connecticut shoreline with distinction until it was finally sold in 2000. A few years later it changed hands again and is now known as the "Three Belles Marina". The article goes on to specifically mention the Mariner in two places. "We're family cruising oriented," stated Warren, who wants more emphasis on that aspect of sailing. "It's easier for us to sell the Mariner, the 22 or the 23 because we can put [families] aboard a 'live aboard' boat [as opposed to a daysailer]. [Warren] feels the Mariner will also sell well to those families who want to combine trailering with family cruising. On a side note, I first fell in love with a derelict Mariner that had showed up at the Boat Yard when I was a teenager occasionally working there. Not having the skills to do the necessary repairs, I eventually gave it away to a woman in Massachusetts who then restored it immaculately. I never forgot that Mariner, and I was determined to have one of my own someday. Enter Orion ten years later.